You’ve rebuilt, nurtured and invested your heart and soul. This car is your pride and joy. Now it’s time to store her. Old gas breaks down over time and can lead to gummed-up or varnished fuel lines, carburetors and injectors. But simply draining fuel before storage is a bad idea, as it will expose bare metal in your car’s tank and fuel system to air and moisture. This is how rust, corrosion, dried gaskets and leaks begin. To avoid both situations, fill your fuel tank 95% full with FRESH fuel. Then add a quality fuel stabilizer to keep the gas fresh for as long as 12 months. Over time, acids, dirt, and water accumulate inside engine oil and transmission fluid. Because engine oil acts as a waste collector for elements that break down while you’re driving, unburned fuel, unspent exhaust gases and water vapor are trapped inside your engine. During months-long storage, some of these chemicals eventually break down the viscosity of old engine oil and transmission fluid, and can even begin to corrode metal surfaces. Use a dry lubricant like a graphite-based cable lube or Dri-Slide. Rubber is sensitive to ultraviolet light, and prolonged exposure to UV light will cause tires to crack, split and fail prematurely. In addition to avoiding prolonged exposure to the sun, you can help prevent “dry rot” and flat spots by inflating tires to their proper level before storage. Start when the engine is cool, and carefully remove all road grime, grease, tar, stains, and bugs from all painted surfaces, chromed parts, and wheels. Make sure you use high-quality cleaners. Once your car is clean and dry, apply a polish to all painted and exposed metal surfaces to protect your finish from color fade caused by UV light. Ideally, you should store your car in a garage or other enclosed area where it’s unlikely to get dented and will be protected from snow, ice, freezing rain and wild temperature variances. If indoor storage is not an option, be sure to get a form-fitting, breathable car cover. Your local auto parts or service store should be able to help find just the right fit and material for your beloved beauty. What else would you add to this list? Let us know on the Cool Rides Online Facebook page! I have a 1940 Ford Deluxe which I am now because of winter storing in my garage with a cover over the car. I have a battery tender running all the time, and I haved filled the gas tank and added fuel stabilizer to premium gas. How often do I need to start the car in the garage? 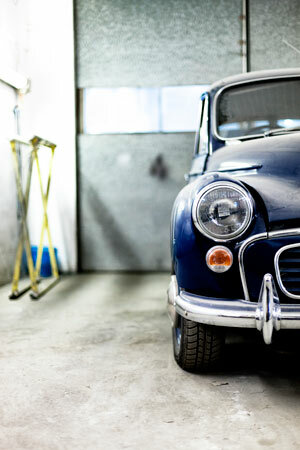 Although it is really not necessary to start the vehicle once it has been properly placed in storage, some mechanics may recommend starting the vehicle once a month at least. It does not need to be on for more than a few minutes. Please contact us at marketing@goldeagle.com if you have any questions about this. Thank you. Would using a battery disconnect on the negative side be sufficient? Or would leaving the positive side hooked up all of the time not be good? Hi Jeffrey, before storage, it is recommended that the battery is fully charged, has the proper hydraulic liquid amount (if it’s serviceable), make sure that the terminals are clean then disconnect the battery. Most people recommend disconnecting the negative terminal only because it may be safer, while others advocate disconnecting the positive or both. However, everyone agrees that using a battery maintainer or tender is best. Please contact us at marketing@goldeagle.com if you have any questions about this. Thank you.